Did the orders pour in because the hot stock’s name was hidden? You decide. The direct mail control package had been a success for years. From the #10 carrier and four-page letter, to the order card, flyer and Business Reply Envelope (BRE), it had all been polished to perfection. But this client was looking for a breakthrough to dramatically build his subscriber base. While respected among his peers, the newsletter’s editor and publisher was relatively unknown to the larger base of over one million investment newsletter subscribers. Craig Huey and his staff created an all new #10 package that took the theme: “The “hook” was one super stock with the potential to be the next Xerox (which rose 4,400% from its initial listing price). Components included a #10 carrier, 8 1/2” x 14” response device, lift note, a BRE and a longer, more informational sales letter. 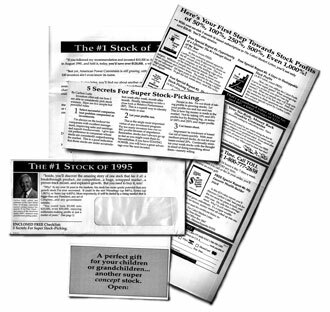 The letter described the super stock without naming it, presented the client’s stock picking system and detailed the many unique benefits of subscribing to the newsletter. Credibility was built up using testimonials and profit examples. And, a very strong offer was developed that included up to 6 FREE Special Reports. Bonus Report #1, titled, Opportunity of a Lifetime: The #1 Concept Stock of the Year was designed to finally reveal the hidden hot stock’s name, and provide the complete story of its potential. If your product or service isn’t generating the kind of enthusiastic response that The Cabot Market Letter is enjoying, the solution to your problem might be as simple as a phone call to Craig Huey at CDMG.